It’s carnival time in Venice and a mask is de rigueur for the celebrations ahead. The charming Mask Seller offers revellers a colourful selection of classic masks – each providing a beguiling disguise and perfect for the Masquerade Ball that traditionally ends the week long festivities. 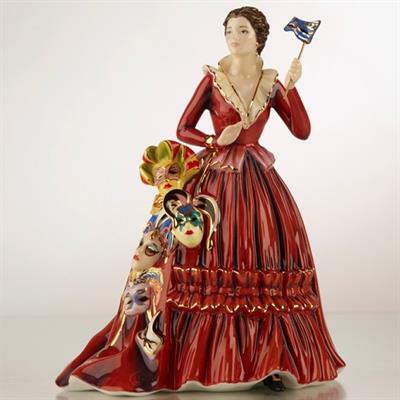 In a dramatic deep red gown with gold highlights adding definition and sparkle the Mask Seller figurine superbly combines story-telling with ceramic art.